I really love the indie maker Pop Culture Cosmetics. and now I have a bunch more that are Halloween & Fall themed! 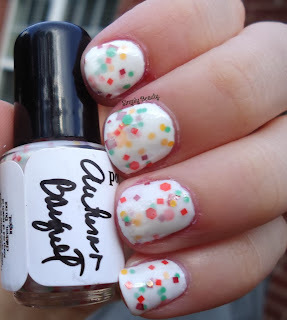 Here's the first of many, 2 coats of 'Autumn Bouquet' over China Glaze 'White on White'. 'Autumn Bouquet' is a milky white crelly with orange, yellow, red, green, and purple square & circle glitters of different sizes. There are also a few blossom glitters in there! I REALLY loved this polish. I love all the Fall glitters, plus that fun addition of purple. I like that there are square and circle glitters, too. 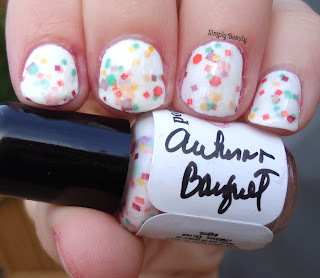 What a fun polish! Love the little pops of color!